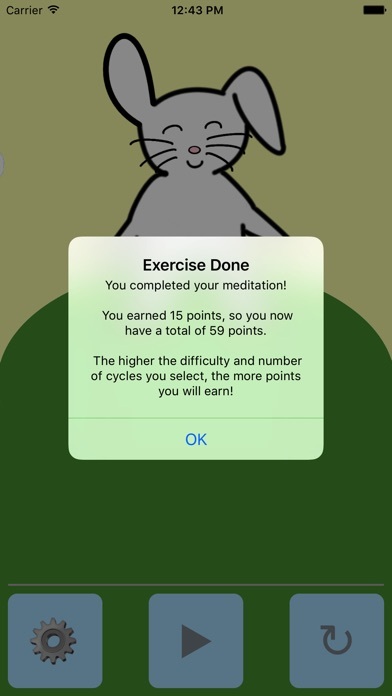 Bunny Mindfulness is a mindful breathing app that shows you how long each breath should be! Meditation is relaxing and makes you calm and happy, so why not do it along with a cute bunny? - NO IN-APP PURCHASES: pay once for the app, and never pay again for any feature or update! - NO INTERNET REQUIRED: once you've downloaded the app, it requires no data connection and sends no information to us! 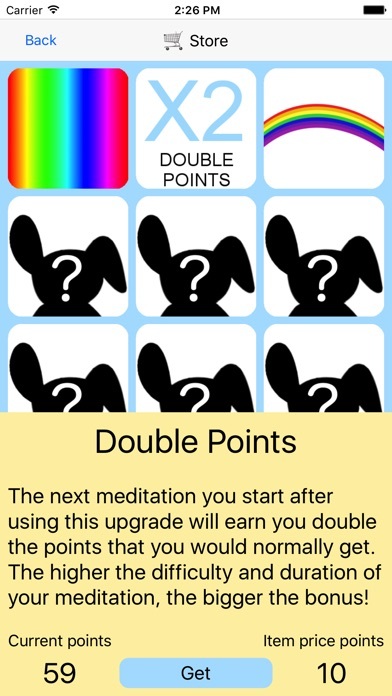 - EARN POINTS: every time you complete a meditation exercise, you get points. The longer the exercise, the more points you get! - STORE: A place to spend the points you earn on fun features! No real life money required for any purchase in the store. - OPTIONAL SOUNDS: control the volume of sounds in the app or turn them off completely! 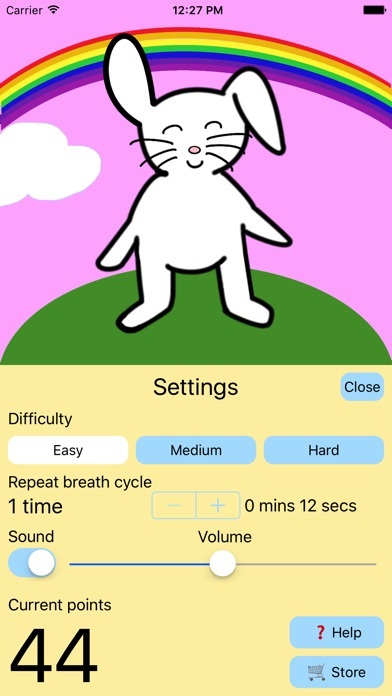 - ANIMATED BREATHING BUNNY: The bunny's tummy fills up as it breaths in and empties when it breathes out! - PROGRESS BAR: the progress bar shows how much time is left in the exercise, depending on how many cycles you choose at what difficulty level! 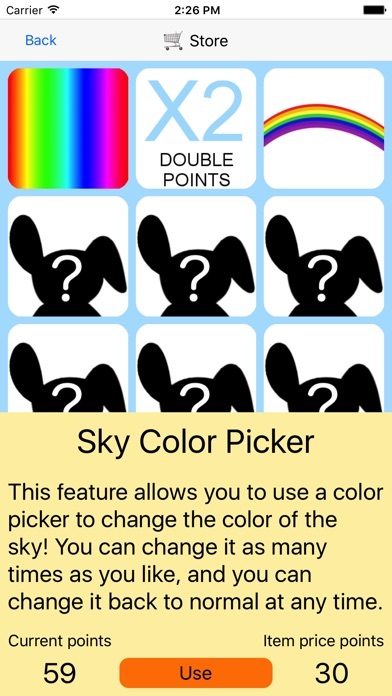 Here's what's available in the store: - SKY COLOR PICKER: choose any color for the sky! - DOUBLE POINTS: Get double the points you would normally get on the next exercise you do! - RAINBOW: Decorate the sky! Custom Alarm Clock: Large, Tiny, Any Color & Font! 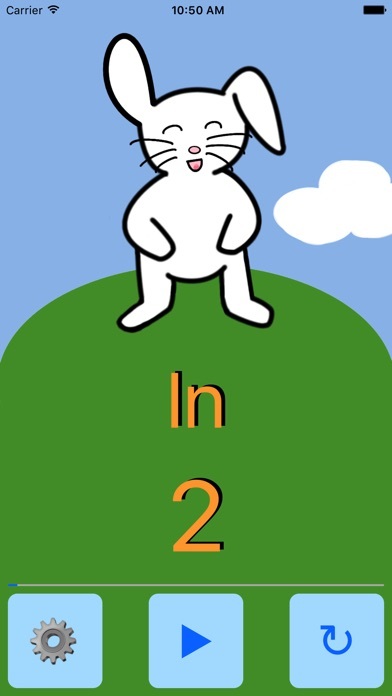 Pet Timer: Cute Bunny, Dog, Cat or Guinea Pig! Colour Calculator: Custom Color Themes You Choose!